← Infallibility of UHJ demands NO ELECTIONS! So many Palestinians are being killed, their lands being occupied, so many acts of violence are being committed against the minority christian community in Israel. Why no word is being issued condemning Israel? Isn’t this hypocrisy? This type of hypocritical behavior of Haifan Baha’i cult is one of the many causes of ‘EXIT BY TROOPS‘ in the Haifan Baha’i cult. 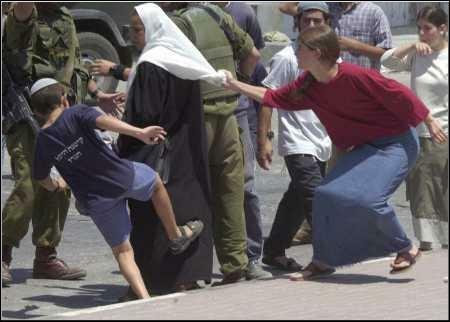 Picture above shows just a single excruciating example of an innocent, defenceless old Palestinian lady being blatantly assaulted by intolerably intolerant young extremist, supremacist Israelis, in full and close up view of completely unconcerned, uniformed IDF soldiers. Will the BIC condemn the burning of Mosque and persecution of Arab Muslim and Christian in Israel? Will BIC ask the Israeli Government to return all the occupied Palestinian lands to the its lawful owners and compensate their losses? Will the BIC ask the Israeli and American governments to release all the innocent prisoners? 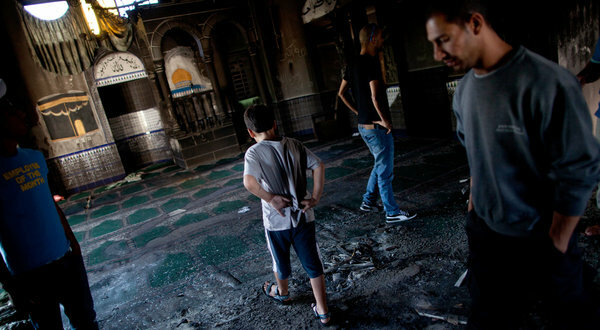 Residents of Tuba-Zangariya inspected damage to their mosque caused by what the Israeli police said was arson. It was the latest in a series of similar assaults on mosques. – 3rd October 2011 – The New York Times.